Shades are on this morning Im sure..speak quietly please! lol ouch my head hurts.. Okay today I have more blog candy. Today I have a level one hostess set from the new autumn mini. You can choose to have this clear mount or wood mount. So leave me a comment to be in the draw. The prize draw is available only to the public and not SU demonstrators. Sorry, but only from NZ or Australia. I will use a random generator when I get back from Sydney to draw the prizes for the week. I have comment moderaton on my blog so if your comment doesnt appear straight away its because I have to approve the comment. No card today as forgot to take a photo of the project. This week I have a sneek peak of a scrapbook LO Ive done that Im teaching at a team training in June..thats coming up this week along with all the goss and swaps Ive got at convention! Home tomorrow ..wish I could stay longer! I love to share Sheila. Thanks for visiting my blog. Hiya! Hope you’re living it up in Sydney!!! Thanks for the comment Sujata and will post some on here as soon as I can. Glad you had a great time.you will come back with even more ideas so will look forward to our next class- Jacquie. Thanks for your comments Ivy and yep have got lots of inspiration and ideas to show you! Thanks for the chance to win this great set of stamps. I hope you enjoyed your stay in Sydney. yes I loved Sydney! Thanks for your comment ..sorry you didnt win ..wish I could give to all! But I do have blog giveaways occasionally so stop by again! Thanks Lesley will post more when I have time..trying to unpack my very large suitcase at the moment! I am sure you had fun at conference and will bring home lots of fantastic ideas. Hey Delys, love this stamp set! I can’t get around the idea of SU having non-wood mounts – its the wooden stamps that I love about SU! The clear mounts are really neat though Lara as you have the clear attributes and the crispness of the rubber. I will still have wood and wont be going entirely to the clear mount. The smaller stamps especially I like in the wood. 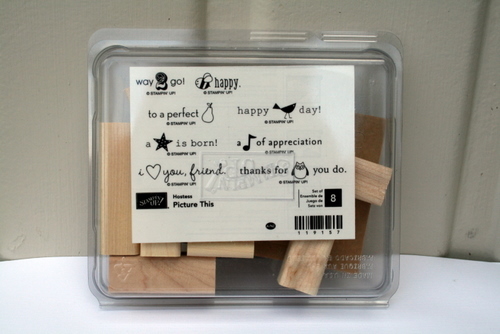 That looks like a cute stamp set, and very versatile. I hope you are taking lots of photos to share with us when you get back. Glad to hear you are having a fab time, hope the head isnt hurting too much!! Look forward to all the new things you have learnt!! It sounds like you are having the time of your life over there. You won’t want to come home.